DSCC reported on Samsung Display’s OLED revenue and fab utilization, showing that revenue peaked in Q417 at US$7.9b as the company fulfilled demand for Apple. Shipments reached 50m units for Apple. Samsung Display Q417 total smartphone OLED display shipments were 119m and 424m for the year. Apple’s iPhone X demand did not justify any additional inventory and Apple essentially cancelled all orders for iPhone X displays. 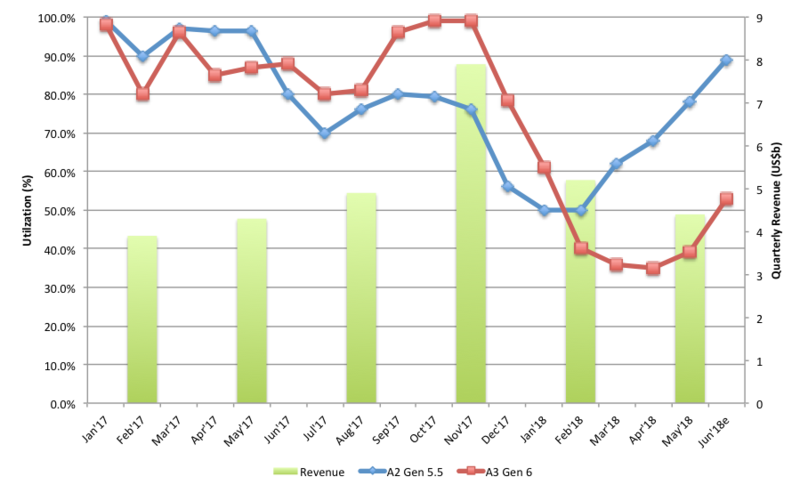 The change is demand caused Samsung’s Gen 6 Fab utilization to drop from near 100% in Q417 to as low as 35% by the end of Q118 and the beginning of Q218. Samsung began an extensive sales push in flexible displays and the utilization is now up to over 50% and is trending upward as shown in the next Figure. Samsung also started pushing rigid displays that are built on it’s A2 fabs (Gen 5.5) resulting in a growing utilization, which is now at almost 90%, up 10% Y/Y and trending up, while 2017 utilization was trending down. Some of the fabs in A3 can produce either rigid or flexible displays but we assume that the fabs are only being used for rigid displays, which are in demand in China. Comparing the Y/Y utilization of A3 fabs, 2018 is still well behind 2017, but is also trending up due in large part to the Galaxy 9 Series and the new Note 9. The utilization is likely to continue trending up as Apple prepares for the iPhone X (next) and the 6.5” iPhone XL (assuming they name it so).